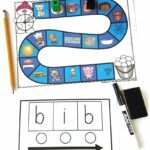 Name games are the perfect way to help your child master one of their favorite words – their name! 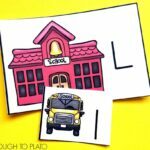 Since there is no word quite as special to a child as her own name, it’s no wonder that many teachers (including me) use a child’s name to introduce the concept of what a letter is, how letters group together to make words, and how a child can use letters to spell. 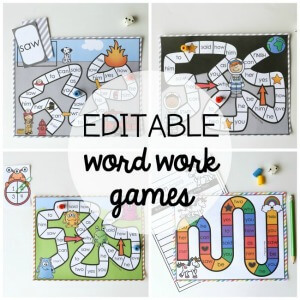 These 5 name games are the perfect compliment to our super popular EDITABLE Name Game Pack! 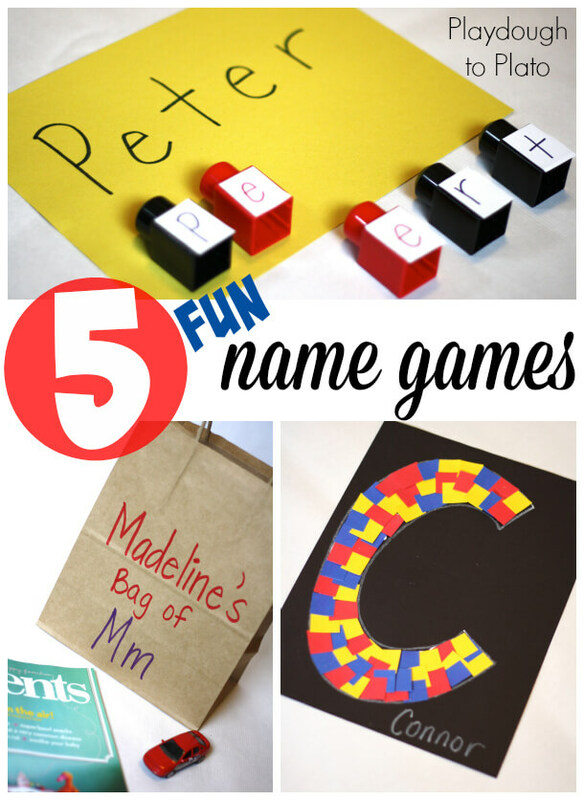 Although there are hundreds of name games that teach these important ideas, here are my five favorites. 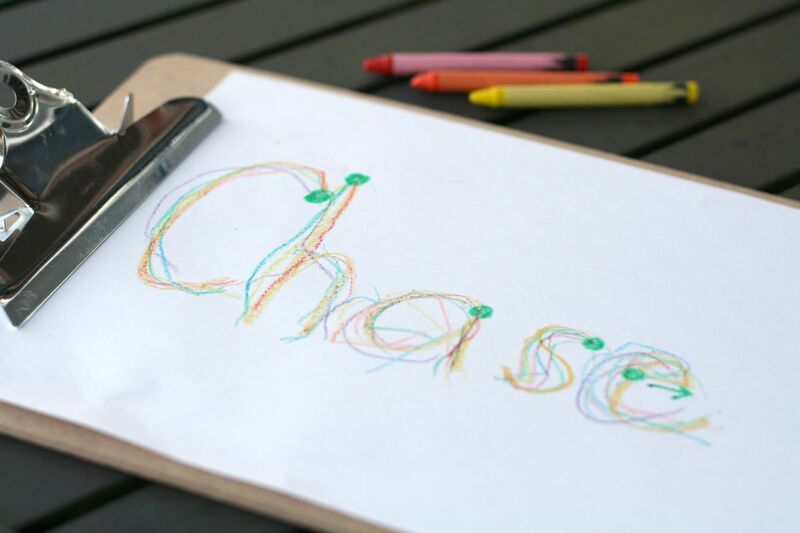 Use a white crayon to write the first letter in your child’s name on a black piece of paper. Cut a pile of small, colorful squares of paper. Ask her to use a glue stick and attach them to the letter. I love the way this looks when it is finished and creating a fancy letter is a great way to explain that the first letter in her name is special and, consequently, is the only letter that uses a capital. Give your child a bag and ask her to fill it with items from around the house that start with the same letter as her name. 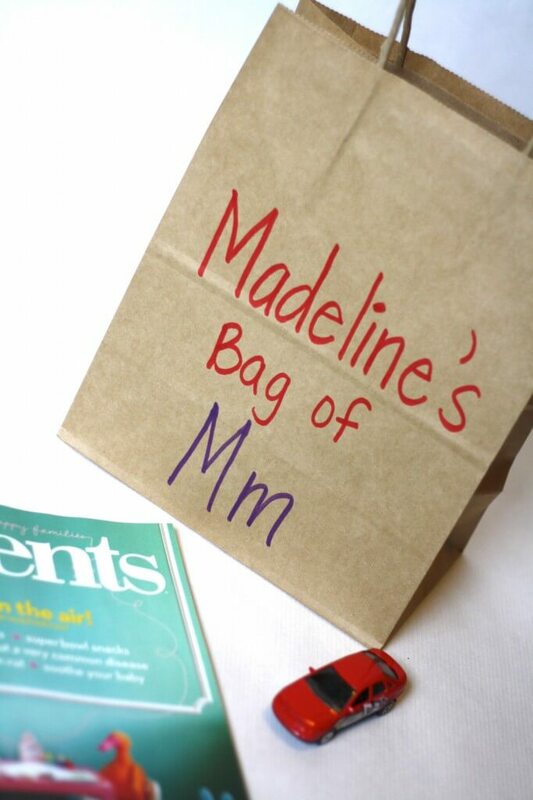 For instance, if your child’s name was Madeline, her bag might say, “Madeline’s bag of Mm” and she would wander around the house collecting Matchbox cars, magazines, and other M-things. 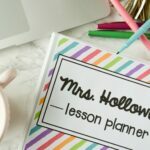 Create a song your child can use to remember the spelling of her name. My oldest son has five letters in his name so we changed the words to the popular song “BINGO” and spell his name instead. 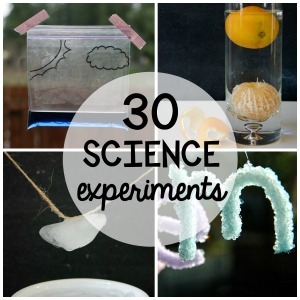 For ideas, check out our favorite tunes here. 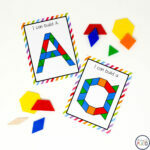 Build her name with blocks. 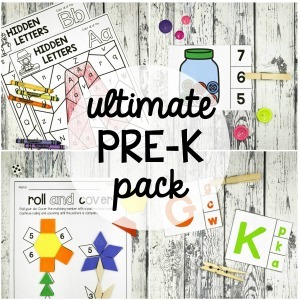 Dig into your child’s bin of Legos or Mega Blocks and pull out as many blocks as there are letters in her name. 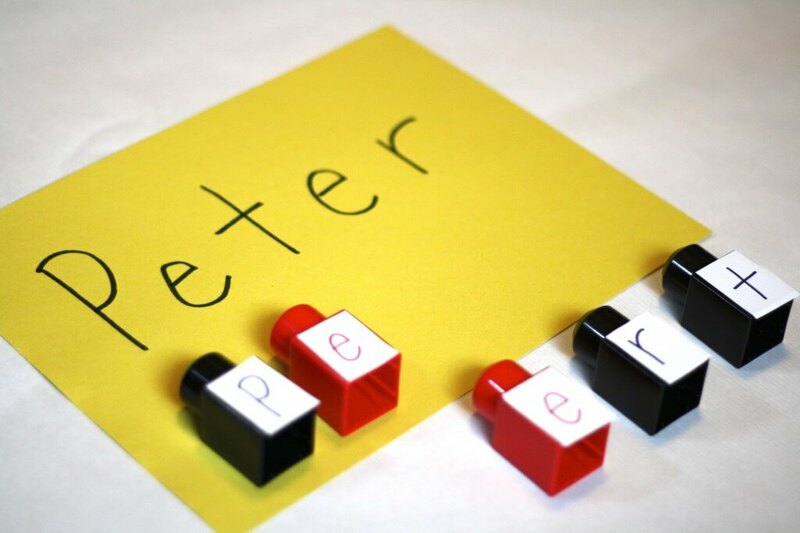 For the example below, I chose five blocks because the name “Peter” has five letters. 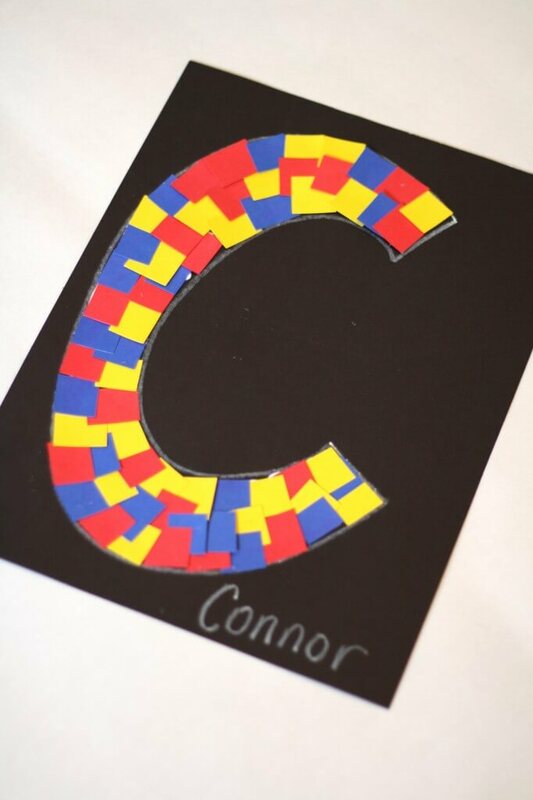 Cut labels to fit nicely onto the side of each block and write one letter of your child’s name on each. 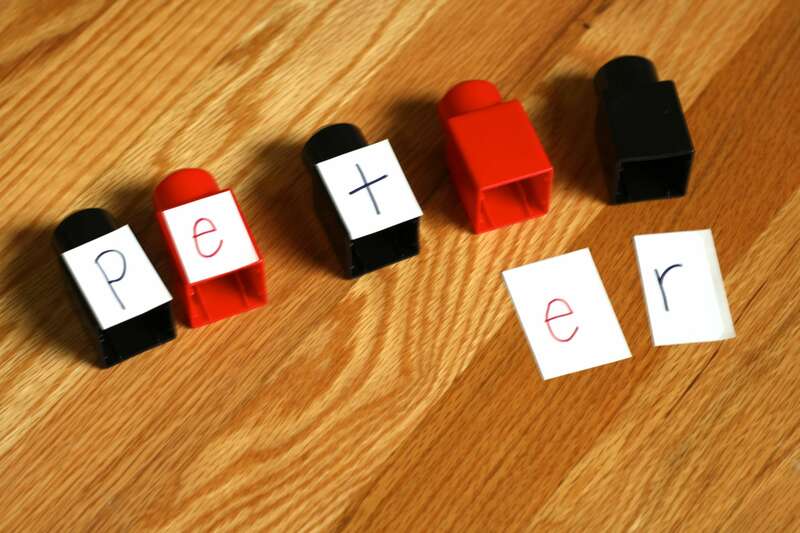 I like to write vowels (A, E, I, O and U) in one color and consonants (all of the other letters in the alphabet) in another color so that I can talk about vowels and consonants later. Now comes the fun. 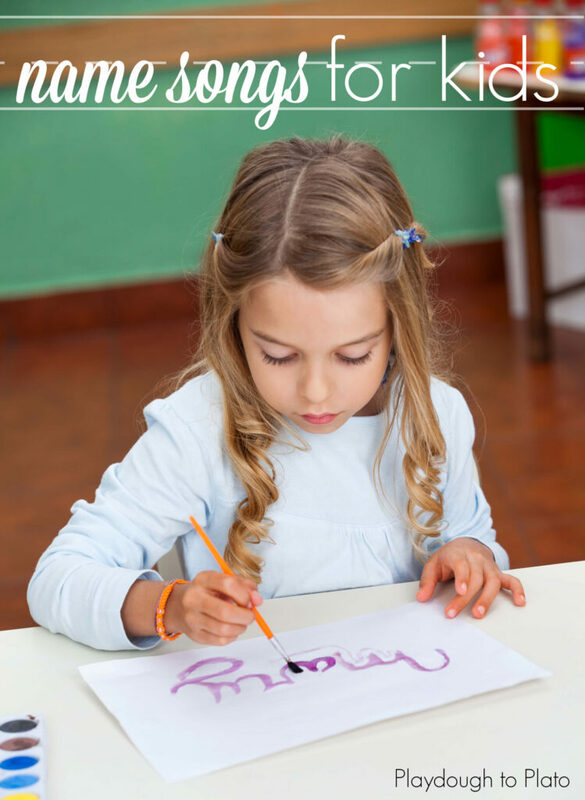 Write down your child’s name on a piece of paper and have her practice “building it” in the correct order. Mix up the letters and have her unscramble them. Sing your child’s name song and have her stick the blocks together as she sings it. 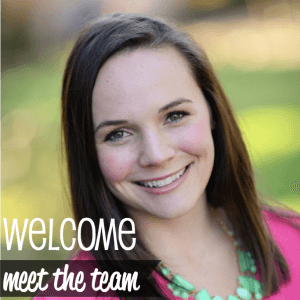 Count the number of letters in her name. Hide one of the letters and have her figure out which letter is missing. 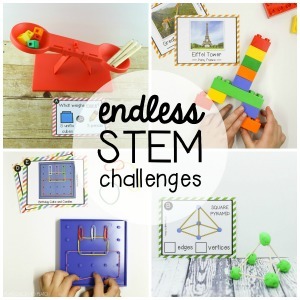 There are so many possibilities. Give her six crayons or markers: red, orange, yellow, green, blue, and purple. 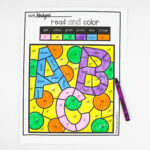 Ask her to trace over the letters in her name using each of the colors. First, she will trace her name with the red crayon. Then she will use orange, etc. 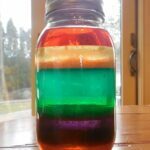 When she is finished, she will have created a name rainbow. 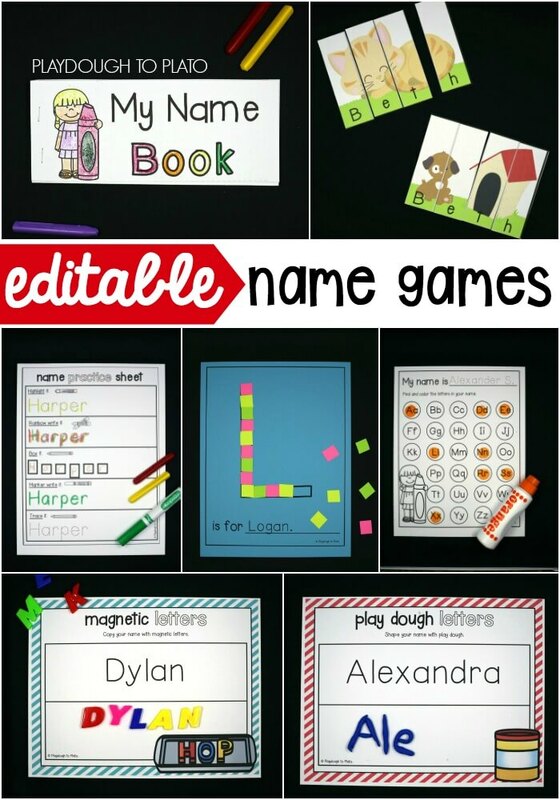 For more fun name practice, grab our EDITABLE Name Games!